Recovering Working Mom: Who's Eddie McStiff? He’s a man we picked up hitchhiking in Moab. Ok, maybe not, but I wanted to make my mother panic. 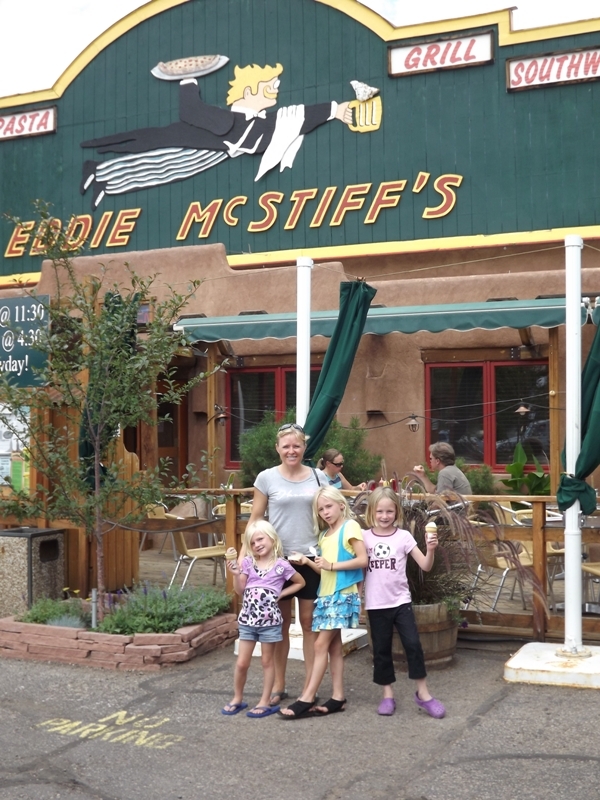 When we saw Eddie McStiff’s Bar and Grill, the 14 year old kid in us came out and we just couldn’t resist taking our children there for lunch. We also started laughing like Beavis and Butthead when we said “McStiff”. The food was actually pretty good, so I’d recommend it – particularly the chicken gyros. They even understood what a gluten allergy was. On to my lessons. I warn you that I’m finishing this post after a glass of wine (that shows you how the day has gone). I would have had more, but I’m “in training” for the Tri and also it was $7 a glass. 1) Sometimes it is necessary to celebrate holidays that serve your own purposes. In one of my random research projects I found out July 17 was National Ice Cream Day. So, the children just had to celebrate National Ice Cream Day and I had to help them. 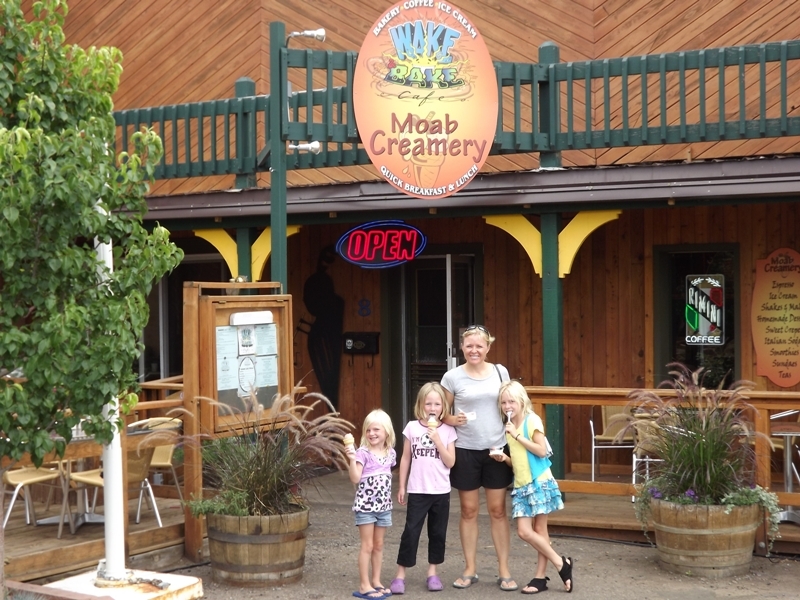 First stop was Moab Creamery. The ice cream was terrible. Don’t get me wrong, we finished it, but it was not good at all. 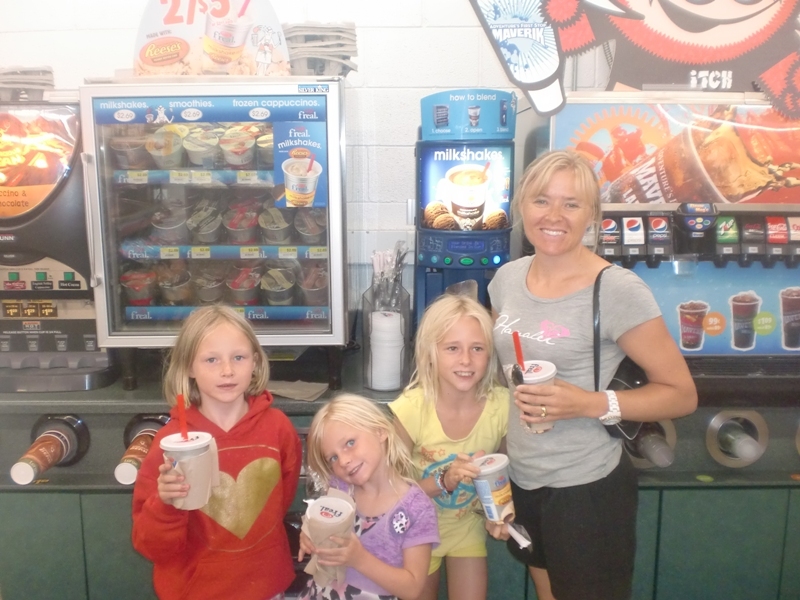 We finished the day with something much better – a Reese’s Peanut Butter Cup shake from a gas station in Salina Utah. a. Side lesson - DO NOT buy your children their own shake. It will end up all over your car the next morning when you go to clean up the car tornado. 2) You will need to carry a porta potty with you into National Parks. Either that, or catheterize your seven year old who has a bladder the size of a thimble. I’m not admitting anything because it very well could be a federal offense, but Ego may have “left her mark” on a bush near one of the arches in Arches National Park. I’m not telling you which one because you might very well turn her in and I can’t allow you to be able to prove it. 3) We saw several storms in the desert (and even had John Denver coincidentally singing that line during one of them) – some were made by nature with thunder and lightning, and were amazing; then there were those made by man (or should I say three tiny little people). It’s the latter that will drive a mother to drink. It doesn’t matter how organized you try to be, your children will create a car tornado anytime they are in it. 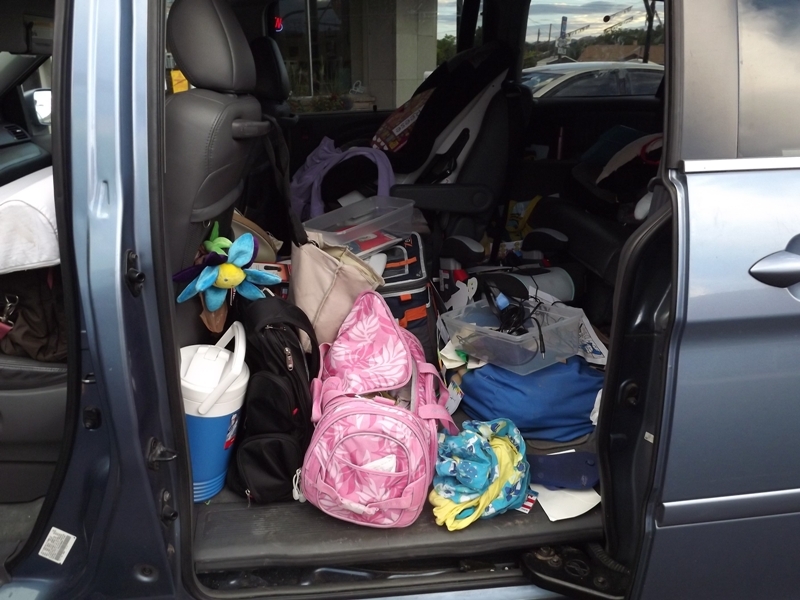 I spent hours buying miniature trash cans, tubs for all their crayons, markers, etc., folders for their papers, and anything else I thought might make things more organized, only to have those things literally explode every time the children set foot in the car. My recommendation, don’t bother being organized with your packing, just throw all the sh*t in the car and go. You’ll be just as likely to find everything that way as you will starting out organized and then driving yourself crazy. 4) If you are in small town America and see something called “Mom’s Café” – you’re guaranteed that “Mom” will have a salad bar with iceberg lettuce, canned pears in their own juice and frog’s eye salad. I really should not have ordered the shoe leather, I mean pork chops. Out of respect for who I am sure are wonderful people, I won’t tell you where this “Mom’s Café” was. Tomorrow is two National Parks in one day. Honestly, which one of you “friends” do I have to thank for needing a lobotomy – you all SHOULD HAVE WARNED ME. What kind of friends are you?! Reese’s Peanut Butter Cup Shakes from Maverick Gas Stations (probably also available at 7-11) – when all else fails, stick with a standby.